Ukali Orali Indeed Is A Live Television Program In Image Channel Television. Various Folk Music Videos Are Played In The Program That Is Daily Aired Every Afternoon From 1 - 2 Pm.Ukali Orali Also Provides Information About Folk Music, Culture, Traditions, Customs Etc In The Show.Presenters Take The Phone Calls From The Audience Which Help The Audience To Interact Directly With Them And Take Part In The Program.The Program Comes With Various Topic Each Day And Also Have Some Guest Artists In The Show Every Sunday. 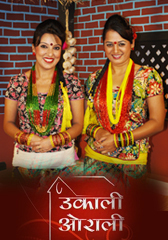 Anusha Dahal Is The Producer Of The Program And Anupa Shrestha Is Executive Producer.Program Is Run By Different Presenters Each Day Such As Anusha Podel, Shova Tripati And Babina Poudel. It Has Different Segment Each Day.